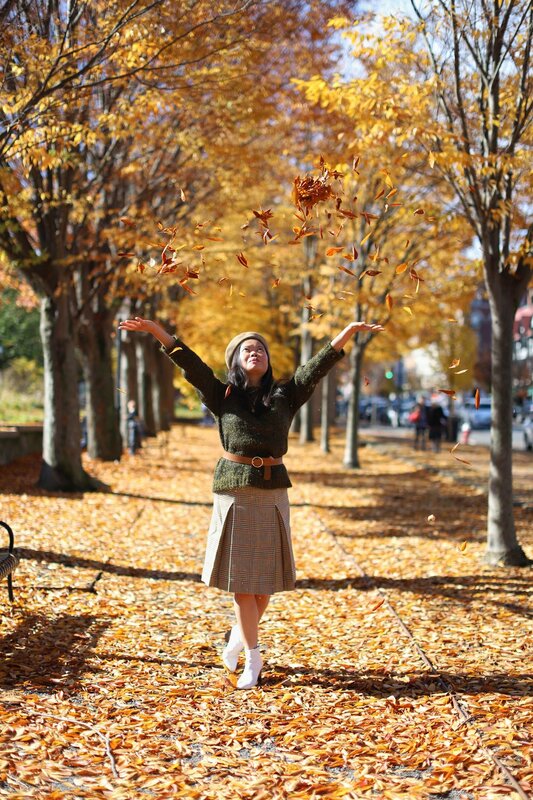 Celebrating the last bits of fall before it’s officially coat season with a frolic through the foliage. When you think of fall style, it’s usually all about the pumpkin spice latte and warm rust colors, but I think this green Geysir wool sweater I got in Iceland a few years ago is pretty fall-perfect. When paired with warm caramel hues and plaid prints, it makes for a dreamy fall color story. Normally I reserve this wool sweater for winter because it screams holiday style, but I had fun trying something new and styling it up for fall this year. How did I do? It’s woven with flecks of metallic gold thread, and this green is the exact shade of Icelandic moss flickering like gold in the Scandi sunlight. p.s. How pretty is this spot on the Princeton University campus? Fields of gold, really. It’s basically the perfect fall backdrop (and provides alllllll the big piles of leaves for your kids to jump in!). Had to fend off a bunch of other photo shoots going on, but what’s a blogger to do? New Jersey is especially pretty at this time of year, all the trees exploded in color overnight a couple weeks ago.